The APPEA Journal contains peer-reviewed full papers and extended abstracts of the oral and poster presentations, all plenary presentations (including PPT slides)*, awards, acreage releases, PESA industry reviews and a selection of material from the social functions. *Where permission to publish has been provided. The APPEA Journal is recognised in the upstream oil and gas industry as Australia’s leading peer-reviewed publication for information on geoscience, engineering and management. This journal, published by CSIRO Publishing, documents technical papers presented at APPEA’s Annual Conference. The Australian Petroleum Exploration Association (APEA) was formed in 1960. Part of its brief was to hold an annual conference where technical papers would be presented and published. The aim was to move the fledgling Australian upstream industry forward. The first APEA Journal was published in 1961. As the industry grew and matured, the Association – and therefore the Journal – changed its name to the Australian Petroleum Production & Exploration Association (APPEA) in 1996. The type of papers in the APPEA Journal has also changed. Currently there is a multidisciplinary approach with three main streams – geoscience, engineering and business management. 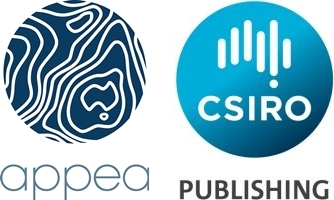 CSIRO Publishing took over publishing the APPEA Journal in 2017. CSIRO is a science and technology publisher with a global reputation for quality products and services that has been publishing journals since 1948. CSIRO Publishing is an Australian-based and fully Australian-owned publisher, with content hosted locally and served to the world. CSIRO Publishing publishes content in print and online, with editorial standards and production methods at the forefront of e-publishing standards. Full disclosure of all references and any financial support that has been obtained from the research being published. Assurance that all authors who contributed to the research are included in the submission and that the data presented is real and authentic. If corrections or mistakes are required, the authors are obliged to provide retractions. The Editorial Board has complete control on rejecting/accepting submissions. To this end the Editorial Board will ensure there is no conflict of interest with respect to submissions. The Board will only accept submissions where it is reasonably certain that all codes have been met. Where errors have been made the Board will promptly publish corrections or retractions. CSIRO is a member of the Committee on Publication Ethics (COPE). This ensures the APPEA Journal fulfils the criteria for best practice publication ethics and integrity and remains a multidisciplinary academic journal.